This practical guide provides college and university faculty with resources for supervising and advising graduate assistants, guiding doctoral students through the dissertation process, and preparing the next generation of scholars. 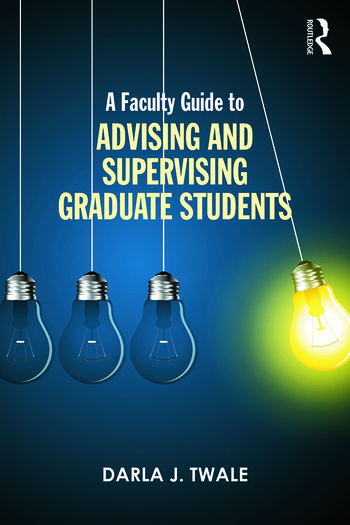 Exploring common situations that faculty and their graduate students encounter, this book provides the theoretical foundation and best practices for faculty to improve their advising and supervising practices. Preface.1. Retaining Graduate Students: The Critical Role of Faculty Advising. 2. Finding the Perfect Fit: Recruiting and Admitting Graduate Students. 3. Laying the Foundation: Forming Strong Faculty/Student Relationships. 4. Working Together: Faculty Advisor and Graduate Advisee. 5. Accounting for Differences: Advising Diverse Groups. 6. Supervising the Future: Assistantships, Clinicals, Internships, and Practicums. 7. Conquering the Academic Wild West: Advising Virtually Using Social Media. 8. Chaperoning the Dance: Chairing Thesis and Dissertation Research. 9. Preparing to Launch: Advising the Professional Rites of Passage. 10. Summarizing Best Practices. Index. Darla J. Twale has coordinated higher education leadership programs, taught for over twenty-five years, advised graduate students, and chaired numerous dissertations. She is an Adjunct Professor at the University of Pittsburgh, USA.